text := mü-nest x PLOP special collaboration series vol. 1: "Peking Scene" by me:mo. The beautiful musical works of me:mo has always able to convey a reminiscing feeling…a feeling that arose from those delicate themes about memories of city, about memories of everyday life. me:mo , by using his subtle music sensitivity, and magnificent arrangement skills, musically re-creating all these old and memorable sceneries that ones were once so familiar with, but are now virtually forgotten. These wonderful but vanishing sceneries, and those memories about the good old days, are the main inspirations for me:mo‘s music composition, prompting him to write pieces after pieces of delicate melodies about these precious things in his life. And gradually, and expectedly, they have become indispensable to his soul and creativity. 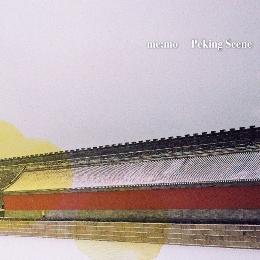 For that, "Peking Scene", is an album written as a gentle elegy specifically dedicated to the gone-but-unforgettable city of Peking, as this exquisite 11-tracks album is full of nostalgic mood that float with remembrance and warm memories of the old days of the city, which still quietly live inside the delicate and beautiful music of me:mo.